What’s at stake at China-US Comprehensive Economic Dialogue? Economic Watch: What’s at stake at China- U.S. Comprehensive Economic Dialogue? Senior Chinese and U.S. officials will meet on economic and trade issues, leaving opportunities for the two sides to crack many hard nuts under the new format. The first round of the Comprehensive Economic Dialogue (CED) will begin on July 19 in Washington. It is one of four major dialogue mechanisms the two sides established in April. With the new platform in place, experts have called on both countries to employ new ways of thinking to address and resolve thorny bilateral and global issues. The dialogue will come 10 days after Chinese President Xi Jinping and U.S. President Donald Trump met on the sidelines of the Group of Twenty (G20) summit in Hamburg, Germany, in which they reaffirmed their commitment to healthy and stable economic ties. China and the United States have been vigorously advancing economic and trade relations. The two sides have made important initial progress in carrying out the 100­day action plan, a key chapter of the CED. A range of deals on financial services, energy and investment have been inked. China greenlighted U.S. beef exports after 14 years of bans, while the United States agreed to allow chicken imports from China. "The results so far in the 100­day program to improve trade and investment appear to have been more constructive than many critics argued," said Douglas Paal, vice President for studies at the Carnegie Endowment for International Peace. "It is possible there will be further progress at the CED," he noted. "We hope it will be a meaningful exchange and help to build an even stronger basis for our economic and trade relations, as we deal with the uncertainties of the global economy," Chinese Ambassador to the United States Cui Tiankai said. "We are looking forward to the mutually beneficial outcomes of this dialogue," he said. at the G20 Hamburg summit. Experts expect addressing the U.S. trade deficit with China will be a top priority for discussion at the CED. Bilateral trade moderated over the past two years, as the world’s top two economies slowed down for cyclical and structural reasons, and a stronger dollar battered U.S. exports, said Zhou Shijian, an economics professor at Tsinghua University. According to the Ministry of Commerce, two­way trade contracted 6.7 percent in 2016 with Chinese exports to the United States down 5.9 percent and China’s imports from the United States down 9.1 percent. Trade volume rose 13.5 percent in the first four months of 2017, with China’s exports to the United States up 11 percent and China’s imports from the United States up 20 percent. To address the U.S. trade deficit with China, it makes a lot of sense for the U.S. side to lift the ban on exports of high­tech products to China in areas such as clean energy, Zhou said. Every U.S. government since the Reagan administration had eased restrictions until President Obama took office in 2009. In his eight years in office, Obama vowed to loosen the controls on several occasions, but never honored his commitment. "The United States currently holds a trade deficit with China of about 300 billion U.S. dollars. The gap could be narrowed by one third if the ban were lifted," Zhou said. 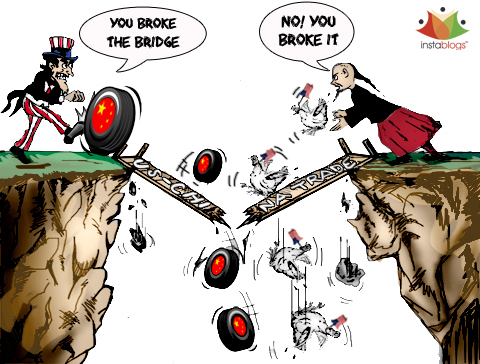 According to the U.S. Department of Commerce, the U.S. deficit with China stood at 347 billion U.S. dollars, accounting for 47 percent of the U.S. total trade deficit. It was good news for the United States that China just allowed imports of U.S. beef. But experts expected it would only have limited impact in balancing trade considering the small trade volume. Whether the current U.S. government is determined to bridge the trade gap or not, how it deals with high­tech product exports to China is probably a touchstone, Zhou said. BIT talks began in 2008, when China and the United States sought to increase mutual investment. But little progress had been made before they agreed in 2013 to conduct negotiations on the basis of pre­establishment national treatment with a negative list approach, which outlines sectors closed to foreign investment. After 33 rounds of negotiations over the past five years, the BIT talks have been shelved by U.S. President Donald Trump’s administration. In 2016, Chinese companies invested a record 46 billion dollars in the United States, tripling the amount in 2015 and a tenfold increase compared to just five years ago, according to a report jointly released by the Rhodium Group and the National Committee on U.S.­China Relations (NCUSCR) in May. Growth of Chinese investment in the United States moderated in 2017. Zhou explained China’s foreign exchange regulation, tax reform of the Trump administration and the lack of progress in the BIT talks may have contributed to the moderation. "The U.S. government needs money to revive the U.S. economy. No better time for it to advance the BIT talks with China. It should do something to create a sound atmosphere for the negotiation," Zhou said.